Many consider Germany's Rothenburg to be the best-preserved medieval town in Europe. Many also consider it a horrible tourist trap. Everyone in the town makes their living off tourism. The place is stampeded midday with visiting tour groups. The town even created its own "traditional" pastry — the Schneeball (snowball) — to complement all the faux traditional Christmas ornaments it sells. Yet when I pass through its medieval gates, I feel like a kid who just got a three-day pass for all the rides at Disneyland. I love Rothenburg and I've long wondered why. Perhaps it's because medieval life comes alive in its cobbled alleys. The ramparts are intact — complete with arrow slits. The fish tanks next to the water fountains still evoke the days when marauding armies would besiege the town, and the townspeople would survive on the grain in its lofts and the trout in its tanks. The Night Watchman stokes his lamp and walks wide-eyed tourists through the back lanes telling stories of hot oil and great plagues. The monastery garden still has its medicinal herbs. And the Medieval Crime and Punishment Museum shows graphically how people were disciplined back when life was nasty, brutish, and short. On a recent visit, I finally realized why I like Rothenburg so much. In spite of its schneeballs, obnoxious tour groups, and Christmas trinkets, it is a community of real characters. And a small enough community where all the characters know each other. Norry — the man whose guesthouse was so creepy and whose moustache was so droopy that I had to sing the Addams' Family theme song with each visit — invented a cross between a trombone and a saxophone that he calls a Norryphone. 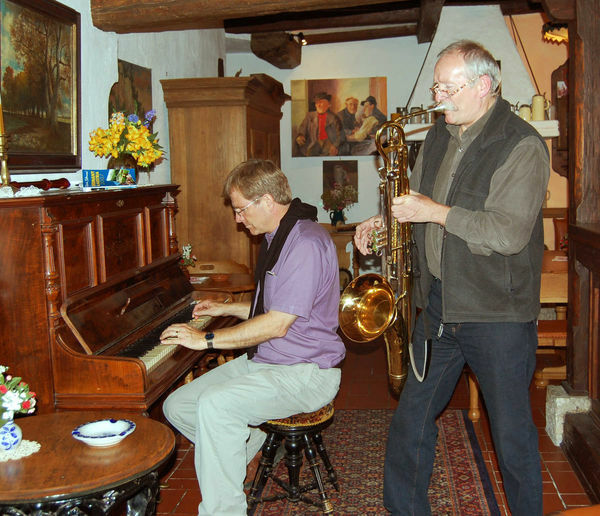 Now with each visit I boogie on his honky-tonk piano while Norry improvises. "Hermann the German" has spent a thousand Wednesdays at Mario's "Old Franconian Wine Stube" hosting the English Conversation Club (where Germans hang out with tourists, sharing slang, tongue-breakers, and beer). Mario — a bohemian chef Gene Wilder look-alike — fastidiously checks each dinner plate as it leaves his kitchen and rents four Monty Python–heaven rooms upstairs. Marie-Therese sells kitschy German knick-knacks so enthusiastically that when she takes me home for dinner, her house feels like the innards of a cuckoo clock — and it doesn't surprise me. Reno the Italian married into the town and runs a great little hotel-restaurant. For a generation his daughter, Henni, has caused travelers to dream in German. Spry Klaus, who runs a B&B above his grocery store, takes travelers jogging with him each evening at 7:30. Every time I walk under her house, I still remember the old woman who lived in the wall who loved showing off her WWII bullet wound. She's gone now. On my last evening in town, everyone seemed to be at Mario's. Hermann the German — holding court with his table of American travelers there for the English Conversation Club — gave me a tiny business card that said: "If I had some of your business I could afford a bigger card." I was enjoying a beer with Henni. Norry was playing chess with Martin, the potter at the next table. Henni tries to impress upon me how sick she thinks it is that American tourists are so nervous about their children having to share a double bed. She keeps repeating, "This is sick in head, krank im Kopf. Never would a European family ask for twin beds for brother and sister. Never. Why Americans...why they insist?" In a small town, everyone knows everything. People get along impressively well. The only gang universally not liked seems to be the cartel of farm boys who take tourists on horse and buggy rides — apparently they are about as charming as their horses. I told Henni of a wonderful new hotel I found run by Herr Hocher (Hotel Spitzweg). I tell her he reminds me of the Wizard of Oz enjoying a relaxed retirement. She concurs and marvels at how I am able to uncover the characters of the town. I marvel at — in Rothenburg — how easy that is. 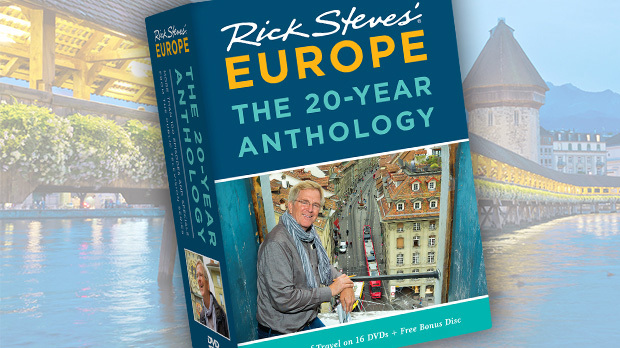 As a guidebook writer, my challenge is to help travelers connect with real people. As I get to return year after year, it's easier for me. For travelers, the challenge is to find places where you can be a part of a quirky yet lovable community…if only for a short visit. 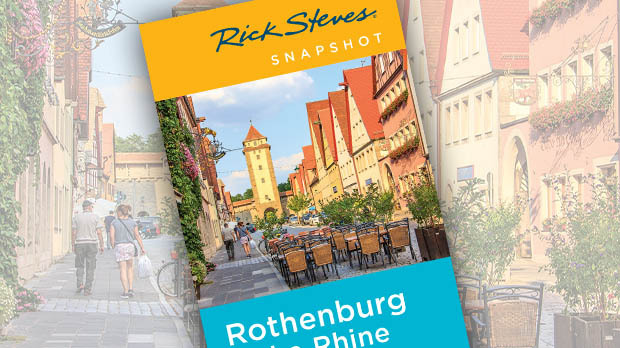 Rothenberg is a good place to start.